Vote for this item to win the HandmadeMN’s July challenge (Circus is the theme). Visit HERE and then scroll down. Vote for “Harvest Moon by Hand” and this entry. Thanks! A little about this item: Each star is folded 18 times per point. With 8 points per star, that’s 144 folds per star. 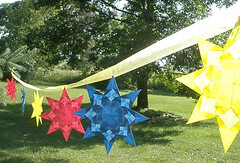 There are 6 stars on the garland which means there are 864 folds to create this garland of stars. When I think about the circus, I think of bright, cheerful colors. Immediately, the window stars came to mind. Wanting to do something different – something I had never seen before done with the window stars – I created a garland of them. Hanging between two pines in the backyard, the sun illuminated the pattern in each star as they waved in the breeze. If you are interested in purchasing this item, please visit my shop HERE. My daughters came up to see what I was doing. Both responded with, “WOW! That’s really pretty, Mom.” That’s always nice to hear. I agree! SO pretty! I voted for you! That garland is just beautiful! Thank you Pom Pom, Naturenest, and Jenn. I'm happy that you liked the garland and my blog. Thanks for the vote, Pom Pom! So beautiful!! I loved seeing all these stars at Christmas when I lived in Germany and have a book to make them but have never found any of the wax paper. Mind if I ask where you got the wax paper for your fabulous stars?